For someone making a living from travel photography, I travel a lot. Most of the time to places I’ve been before more than once, but at least once or twice a year, to places completely new to me. Sometimes this is for assignment purposes and others for the sheer pleasure of travelling - but all of those with a significant focus on photography. Travelling to Myanmar is not as complex as it was 10 years ago - actually, travelling anywhere isn’t anymore. It is actually surprisingly easy and straightforward and everything you need is readily available - internal flights galore, hotels, transport companies, guides, restaurants for all tastes…literally everything. Except that is, from the pictures - getting the pictures is almost impossible. Think about it: what is it that you picture when you think about Myanmar? 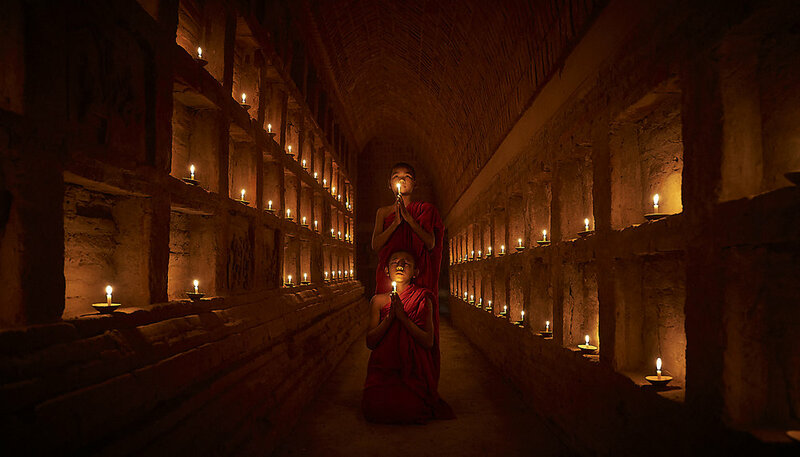 You think of monks with their umbrellas and alms bowls, you think of long white corridors with lovely light, of dark and secret temples lit magically by candlelight, about temples bathed in golden light. 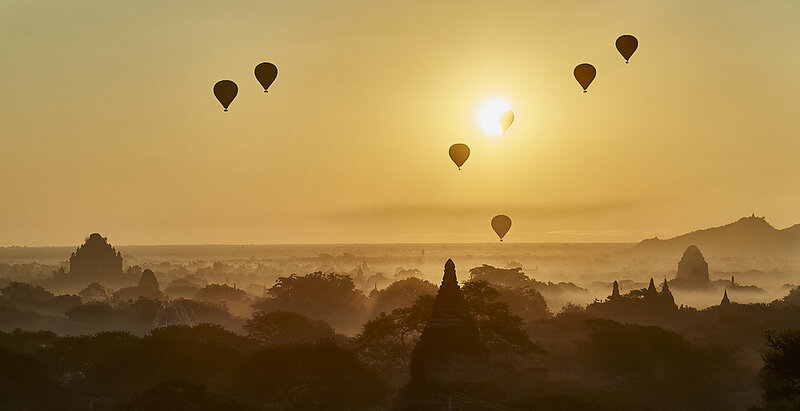 And then you land in Bagan (or any other place) and none of those are there. Yes, there are monks everywhere, but not a single one carries the iconic red umbrella and none of them rest along deserted temples (or pray surrounded by candles in them) and most amazing locations are packed with tourists or locked by the archeological office. Trying to recreate any image you have in mind is impossible. So, what do you do? You have two options: rent one of those stupid e-bikes and wander around inhaling dust and fumes for 10 hours a day hoping to find the temple in your mind and then, oh, I don’t know, hope a monk passes by? Or you hire a fixer. A local, professional fixer - not a guide - with specialism in photography. And that is where the fun begins. You need to have done your research - exhaustive research. You find the images that inspire you, you cross-reference them for possible locations, times of the day, etc. and then you compile your look book which you communicate to your fixer - he needs to know exactly what you want to achieve. You need to be very specific and detailed, you need to be flexible and willing to think outside the box but eventually, after a few months of going back and forth, of examining different ideas, shooting down impossible alternatives etc., you arrive at a detailed (and I do mean detailed) shooting schedule. Only then do you set your foot on a plane. Any other option will not, I repeat, will not get you any of the shots you were dreaming. I’ll examine the ethics behind this a bit later, but for now, please follow along and it’ll all make sense - this is, after all, an article about fixers and photography, right? So, you and your experienced fixer(s) decide on each shot, nail down the location, the time (because, lets face it, the light is different at different times for each location - especially when those are tiny windows in small temples), plan on the various logistics (candles, umbrellas, etc.) and, more importantly, obtain permission from one of the nearby monasteries to “borrow” one or two of their novice monks for a few hours a day for a photoshoot. All these things take time - loads of time - and sometimes you may be forced to adjust an entire schedule just because one little element. ALL of these can only happen with the aid of your fixer - you cannot do any of those alone or remotely. To sum it up for you: more than 75% of photography in Myanmar needs a fixer to happen - at least to a high level. Ignore this at your own peril. But, let me get back to the importance of a fixer. A fixer knows when the light will hit a specific window at the right angle to create light trails. He knows which of the 2160+ temples have a platform on which your young novice monks can climb - legally - for those golden hour shots you had in mind. He will know where those really rare columns of red and gold teak pillars are (and just for your information, they are at a monastery more than 90’ away from Bagan and you do need someone who’s been there to find it - there are no maps to take you there!) and he will actually make the trip a few weeks before you are due to go, speak to the abbott and get you permission to shoot. He will ensure that you will have access to the novice monks you want, at the times you need them and, even more importantly, will be willing to work with you (and yes, you may and up with sullen, uncooperative monks - which is fully understandable from their point of view - which will mean you will come away with nothing). All of the above are complicated, take time to get right and for each of them, you need to have at least two backups and alternative ideas - each requiring additional planning and so on and so forth. And none of the above can be organised remotely or through the internet. Even landing in Myanmar and trying to organise this at the last moment is absolutely impossible - good guides are hard to find and usually get booked months in advance. And this is why you need a professional guide. Why you need careful planning. And I think that by now you can pretty much figure out what happens if you use an inexperienced fixer or just a tourist guide. What has this experienced taught me? Well, to always use a fixer for one. To never assume that the picture I have in mind (or I have promised a client) is achievable without special arrangements (and yes, I am guilty of having done that more than a few times even though most of the times it turned out all right - statistically speaking, I have been insanely fortunate!) To leverage expertise where and when it is available and to do so as early and as extensively as possible. In fact, I have already done that for my next assignment in Ethiopia where I’ve already employed two separate fixers at two very distant locations. I mean, please, have a look at the images below and tell me I am wrong. Yes, the images you see of Bagan and Inle Lake and Mandalay and others are, to varying extends, staged. They were carefully posed and created by me with the help of Aung Aung, my wonderful fixer, and were the result of careful pre-visualisation, detailed planning, long-hours of shooting and yes, even artificial lighting (I’ll let you try and guess which is which). You will NOT see these images if you walk around these areas, not in a million years. So, in the strictest of senses, these are not representative of how Myanmar is today. 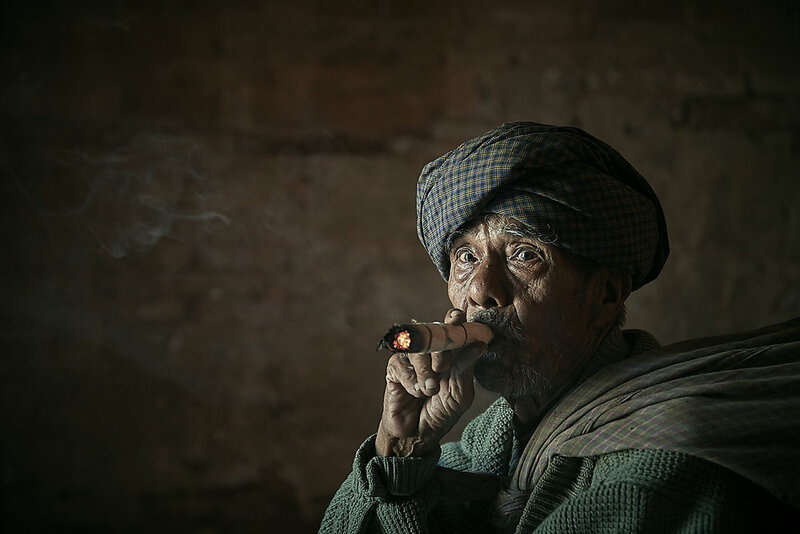 But they are how Myanmar once was - at a time when 5,000 e-bikes didn’t cover everything in dust and massive tourist buses did not spew out thousands of garishly-clothed people and when monks did indeed visit the temples to pray at dawn or study in peace. They are representative of a gentler, easier and more beautiful time. This one time, the camera - through the medium of the thinking photographer and his trusted fixer - actually affords us a short trip back in time and a glimpse of the past, in glorious colour and detail. These crafted images are not about photojournalism and they are not about how Myanmar is today - they were never intended to be that. If you want “photojournalism” about Bagan, just search in Facebook and you’ll see millions of really badly taken shots with iPads and phones, amidst the dust raised by the e-bikes and the cars, with maybe a monk or a temple in the background. Before you criticise someone, look to yourself...! Why your "travel" or "street" photography is not what you think it is...!